When you select View/Edit Log File... it will open the log file in whatever program is currently set to open text files. This is normally Notepad. So you can use Notepad's File -> Save As... to save a copy of the log file to wherever you like. 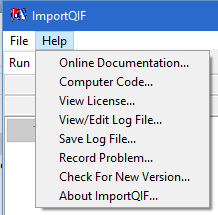 Starting in ImportQIF 3.0.1.0 you can also use the Save Log File... Help menu selection to do the same thing. When you use Help -> View/Edit Log File... it is opening the current log file, if you make changes they will affect the actual log file, not a copy of it. For instance you could open the log file and select all the text with Ctrl+A and then hit the Delete key to delete everything. And then if you do: File -> Save (or Ctrl+S), that would empty the log file. The default log level is Error. At this level only some basic information like the version number of ImportQIF and critical errors are logged. With this setting the log file shouldn't have any data that people would consider personal in it (but be sure to check for yourself, if you are sending the log anywhere). This setting is fine for the kind of errors that pop up a dialog and tell the user about them. The Warning log level will log more information, including information on why ImportQIF rejected a given CSV or Excel file line. This log level is needed to track down problems with CSV or Excel file column mapping problems. Transaction information will be in the log, so this might be considered sensitive to people, and they should take the appropriate steps to safe guard it. The Information level will log everything possible, which may be needed to track down bugs or other problems that are hard to troubleshoot.